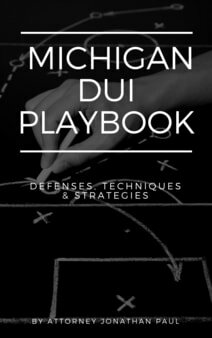 If you're charged with drunk driving in Michigan, you may decide to proceed to trial. Going to trial means making the decision of whether you want a trial by jury or a trial by judge. If you select a trial by jury, you will have 6 jury members for a misdemeanor, and 12 members for a felony. There are several things to consider when deciding whether to try a case to a judge or a jury. The single most important factor is the judge who would hear the bench trial. Judges have reputations and a history on drunk driving cases, and this will be extremely important. There are some judges in Michigan where no matter what, you're probably not going to do a bench trial in front of, but there are some judges who are very good fits for a bench trial. Judges in general see a lot of DUI cases each year, and have pretty good knowledge about these types of cases versus any other type of cases. The judge will compare your case to other cases he has heard, and will be able to really narrow down the facts, and if you're intend guilty beyond a reasonable doubt - in short, there's no fooling a judge with certain common defenses presented to juries. Sometimes very technical defenses are better for a well-educated judge who is familiar with the science. The other factor in making this decision is the city, township etc where the case will be heard. There are certain communities that are better to try jury cases with than others. The facts of your case will also be a major factor in this decision. A judge may be more zero tolerance, viewing say a 0.08 and 0.16 to be the same thing whereas a jury may cut you a break if you're right at that legal limit. Many members of the jury will reflect back on their time behind a wheel, and admit to themselves they may have been in a similar position. A high BAC number may really turn off a jury whereas a judge may understand a technical defense that explains away this seemingly high alcohol level.